New Summer Service Camp Opportunity - Sign up happening now! We are extremely excited to host Meals on Wheels first summer service camp! We are inviting area kids (rising 3rd - 6th graders) to join us in learning about our non-profit and how we help the community. Campers will help pack over 200 meals daily, deliver meals, and also create cards of encouragement to be given to our clients. In addition to creating an opportunity to inspire our children to give back, all proceeds from the camp go directly to Meals on Wheels to continue our mission. Join us! Join us for these amazing events during MARCH FOR MEALS! Duel Chef Showdown benefits Meals on Wheels! On Monday, March 5th, two local chefs gathered at the Tin Whistle Irish Pub in Charlottesville for the 12th “Duel Chef Showdown.” Junction’s Executive Chef Melissa Close-Hart and Tasting’s Executive Chef Michael Berry went head-to-head in a fun-filled and delicious competition with proceeds benefitting Meals on Wheels of Charlottesville/Albemarle. Diners were served an abundant four-course meal consisting of eight total plates – four dishes by each chef. The common ingredient in all the dishes was local Greenberry’s coffee. Following each course, each diner voted for their favorite dish -highlights included Melissa’s Mexicoke-Coffee BBQ Glazed Jumbo Shrimp, Plantain, Baby Romaine Hearts, Corn Salad with Cilantro-Buttermilk Dressing and Michael’s Sumatra Rubbed Brisket Lightly Smoked and Braised, Parsnip and Potato Puree, Bacon Buttered Brioche, Grilled Chicory with Tanzania Coffee Reduction. The evening, part of the first round of The Duel Chef Showdown, a tournament-style event sponsored by the Tin Whistle Irish Pub, I Love CVille and Scotology, with each showdown benefitting a different local charity. Juction’s Melissa easily won the night, with the largest recorded margin of victory, and now moves to the final four. On June 11, 2018, she will battle Tavern & Grocery’s David Morgan for a place in the finals. “What an amazing event,” said one diner, “We got to sample the work of local master chefs and help our community at the same time. 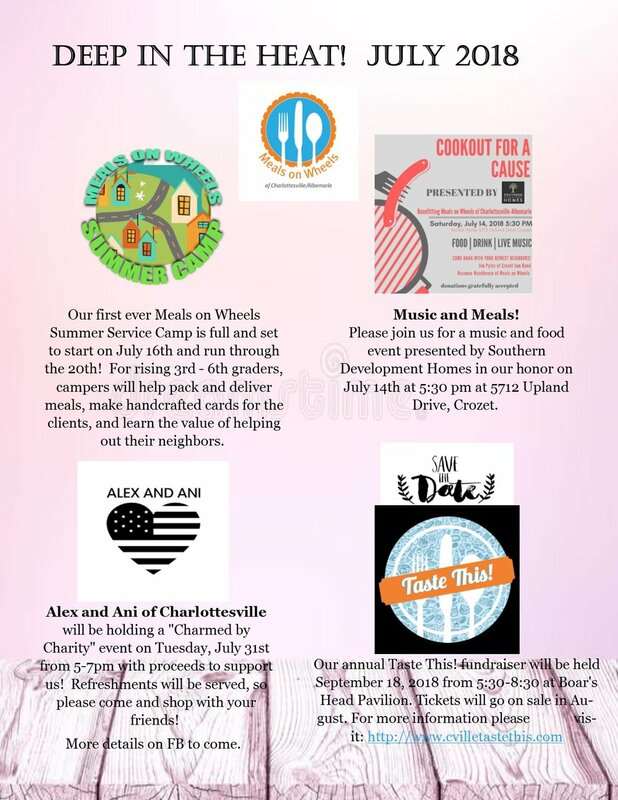 I want to attend every Showdown!” A great time was had by all as the chefs battled for votes and the diners relished in their efforts, but, of course, the real winner was Meals on Wheels of Charlottesville/Albemarle. Many thanks to all for making this possible! This March, hundreds of local Meals on Wheels programs across the country will reach out to their communities to build the support to enable them to deliver nutritious meals, friendly visits and safety checks to America's seniors and homebound residents all year long. 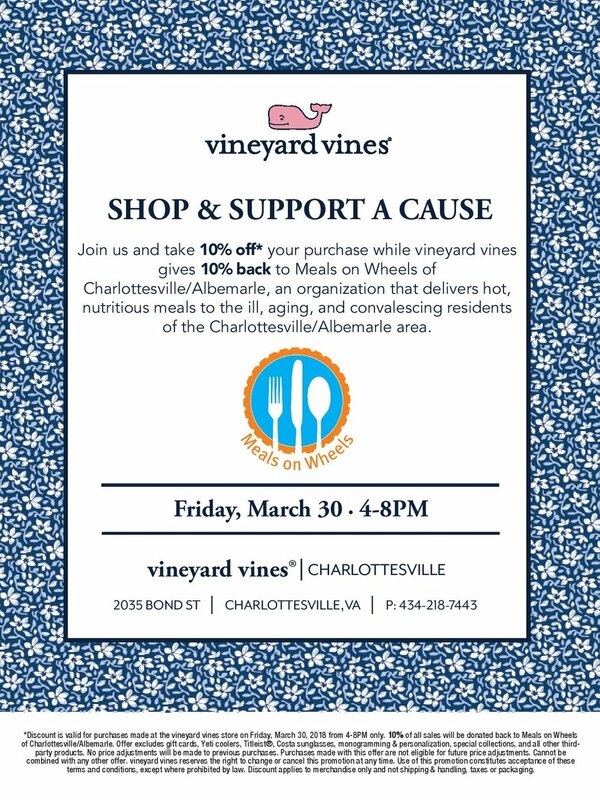 As part of this national campaign Meals on Wheels of Charlottesville/Albemarle will be hosting our first March the Mall for Meals on Charlottesville’s Historic Downtown Mall on St. Patrick's Day Saturday, March 17, 2018. The walk is approximately 1 mile and will take place rain or shine. By walking, donating, sponsoring or speaking out you can ensure your homebound neighbors can live more healthy, happy and independent lives at home, where they want to be. You will help us to continue to provide over 65,000 meals a year and a friendly visit to people who would otherwise be hungry and alone.